For most of its history, Big Trees was patronized via the main stop just above, at first, the Welch Grove and, later, the Henry Cowell Grove. 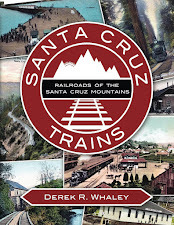 However, the purchase of the Welch park by Santa Cruz County in 1930 changed the location's dynamic with the Southern Pacific Railroad. For the first two years after the establishment of Santa Cruz County Big Trees Park, passengers continued to debark excursion trains at the old Big Trees location, but increasingly they opted for a new flag-stop just to the north called on railroad timetables Big Trees (North Gate). An excursion train parked on a spur at Big Trees (North Gate), late 1940s. Main track in foreground. Photo by L. L. Bonney. From 1936 until 1965, the North Gate catered to all passenger trains visiting the county park. Henry Cowell's grove, in fact, closed in 1942 soon after the U.S.-entry into World War II, so access to the county park was not even possible from that direction thereafter. At the North Gate, a pair of short sidings were installed within the Welch Ranch property so that commuter trains and freight cars from Olympia could operate along the mainline. The station had no other facilities and passengers detrained via the stairs on the passenger cars. From these sidings, tourists entered Big Trees Park down a short pathway that exited beside the Big Trees Inn, which served as a visitor's center and snack shop for the park. 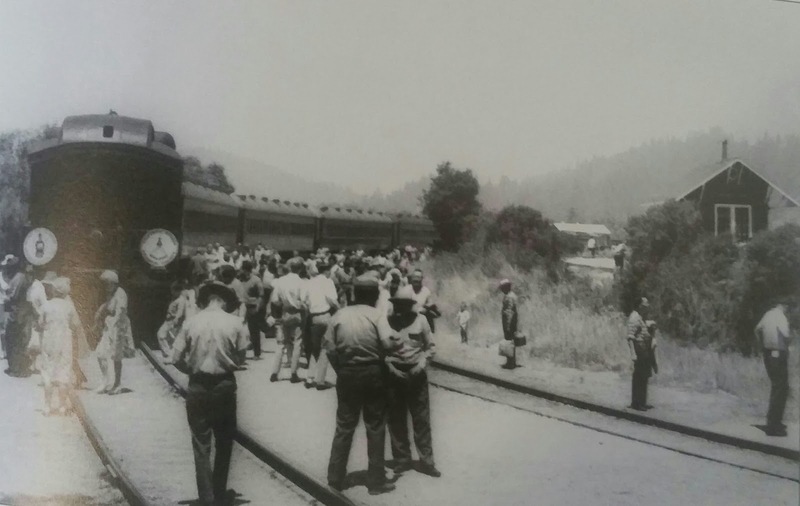 After the closure of the route through the Santa Cruz Mountains to San Jose in February 1940, North Gate became the end-of-the-line for excursion trains, and they constituted the only passenger trains to use this stretch of track, almost exclusively in the summer months. From 1940-1941 and 1947-1959, Suntan Specials would sometimes travel up to the North Gate on Sundays, depending on passenger demand. There were also fairly regular special excursions to Big Trees, although these began to decline in the late 1950s, after the county sold the park to the state where it became Henry Cowell Redwoods State Park. In the final few years, there was only one excursion per year to Big Trees, and those ended in 1965, after which the entire line was downgraded to freight-only service. As a result, Big Trees (North Gate) shut down. Picnickers hanging around the end of the last Big Trees excursion train, 1965. Note Roaring Camp depot in the background. 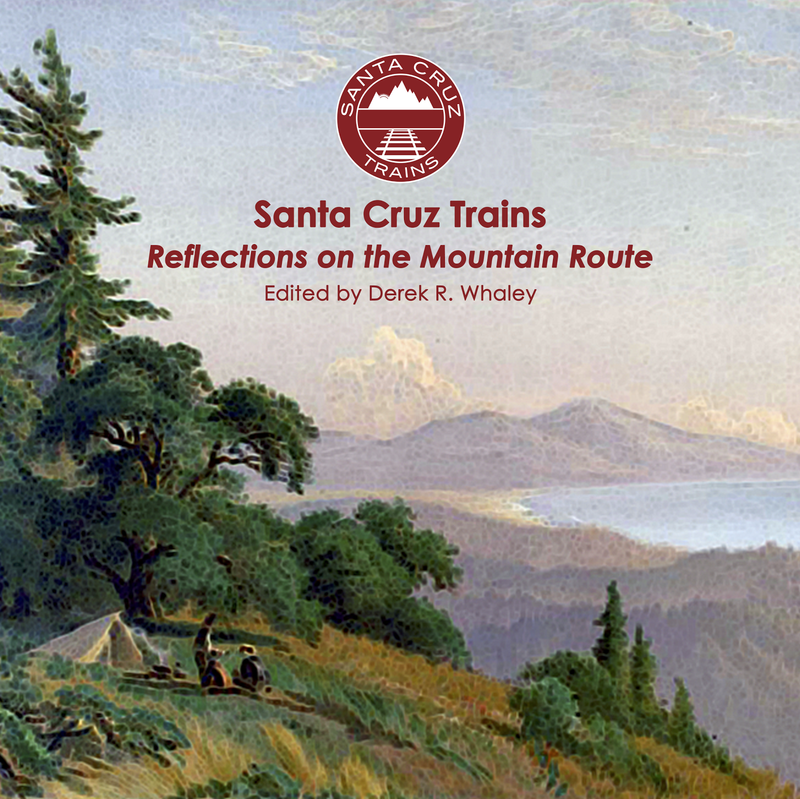 At around the same time, Roaring Camp Railroads was founded just to the east of the tracks. Indeed, this was likely the reason why the excursions lasted as long as they did, since in the final three years, passengers were able to visit the burgeoning resort and ride the Dixiana, their first narrow-gauge locomotive. But even the draw of this new popular attraction was not enough to convince Southern Pacific to keep the trains going annually. Not long after excursion service ended, the sidings were removed. However, the stop set an important precedent that survives to this day: the pathway between Big Trees (North Gate) and Henry Cowell Redwoods State Park still survives, a relic of a time when trains brought people from all over the Bay Area to visit the redwoods. The North Gate of Big Trees still exists and is used frequently to allow people to pass between Roaring Camp and Henry Cowell Redwoods State Park. It is the short connecting path that crosses the narrow-gauge and standard-gauge railroad tracks near the Roaring Camp mill pond and exits into the Henry Cowell parking lot. The former sidings once ran from roughly the site of the Roaring Camp water tower to just beyond where the cabooses are now parked. The only remnants of the sidings are the tracks that the cabooses sit atop. for light freight service only."